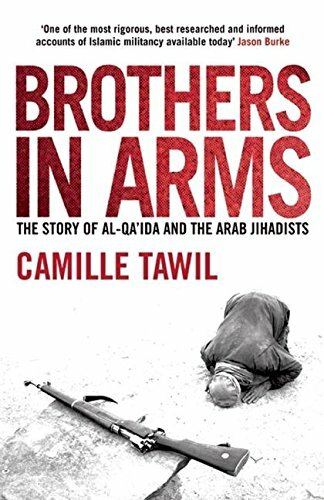 In Brothers in Arms: The Story of Al Qa’ida and the Arab Jihadists Camille Tawil opens up the world of the jihadis in the years between the defeat of the Soviets in Afghanistan and September 11, 2001. The end of the war saw many jihadis returning to their countries of origin, expecting to be welcomed with open arms by a people ready to spread the holy war to Libya, Egypt, Tunisia, and elsewhere. Mr. Tawil delves into the quagmire-like politics of the time: the relations between the groups and their governments, between the groups themselves, and the individuals in them. With the military regime cracking down on the opposition after losing Algeria’s first elections in decades, the returning jihadis tried to do there what they had so successfully done in Afghanistan. While much of the populace was at first supportive of the jihadis, their excesses and destructiveness soon turned that sympathy against them. Mr. Tawil analyzes the Algerian jihad from the point of view of the fighters and goes into new details about the splits between the different militant factions. Some of these splits were over the aims and goals while others were merely clerical hairsplitting over religious tenets. Libya is a grossly neglected front in the Global War on Terror and much of the attention of government and academic researchers has been on Colonel Qaddafi and his regime as oppressors of Islamists rather than targets. Mr. Tawil details the history of the Libyan Islamic Fighting Group (LIFG) from its early days as part of the Afghan Jihad to exile in London then in Sudan, and its ineffective attacks against the regime in Libya, before finally returning to Afghanistan. The Egyptian Islamic Jihad has been studied extensively in the past, but Mr. Tawil puts renewed focus on the group and adds the militants’ own stories of the infighting and politics of the time. Of particular interest are the sojourns all these groups took in Sudan including the amusing story of the Libyan jihadi who was questioned by Sudanese police and could not remember the fake name on the passport. What may surprise the newcomers to studying the groups and period is the sheer level of infighting between the groups and their members. The flurry of group and individual names, and noms de guerre, would be confusing without Mr. Tawil’s detailed footnotes to keep it all straight. Brothers in Arms is an excellent source for anyone interested in the region. The final chapter on the state of jihad in Saudi Arabia, Iraq, and North Africa gives warning to the regimes these groups tried to dislodge, and that while they may be temporarily down, they are far from out. Russ Stover is a terrorism and crime analyst whose tools have included forensics, statistical analysis, and data recovery. Early in his career he was a fingerprint specialist at the FBI, and has since been an analyst at the National Cyber-Forensic Training Alliance and Open Source Intelligence Exchange, as well as a computer crime specialist at the National White Collar Crime Center.